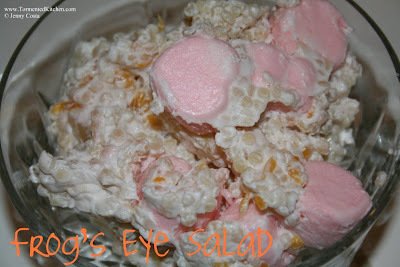 Frog's Eye Salad. Doesn't that name just sound gross? It sounds kind of like Halloween food to me. When I look at this in a bowl, I think it should have a nice name. Maybe I will just call it something else. 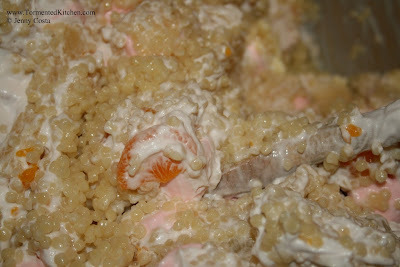 Maybe I will just call it ambrosia or picnic fruit salad. Or I will make up something odd like "insalata con acini de frutta" which really means nothing in Italian. I like making up words. How about Fru-cini? Prounounced Froo-cheenee. What about Fru-cina-lata (froo-cheena-laa-tah)? This dish uses a tiny shaped pasta called Acini de pepe. They are just little balls of pasta. For anyone unfamiliar with the pronunciation of Acini de pepe, the correct way to say it is "ah-chee-knee duh pay-pay". Wow, I didn't realize I was going to be giving Italian language lessons on a food blog. Go me! 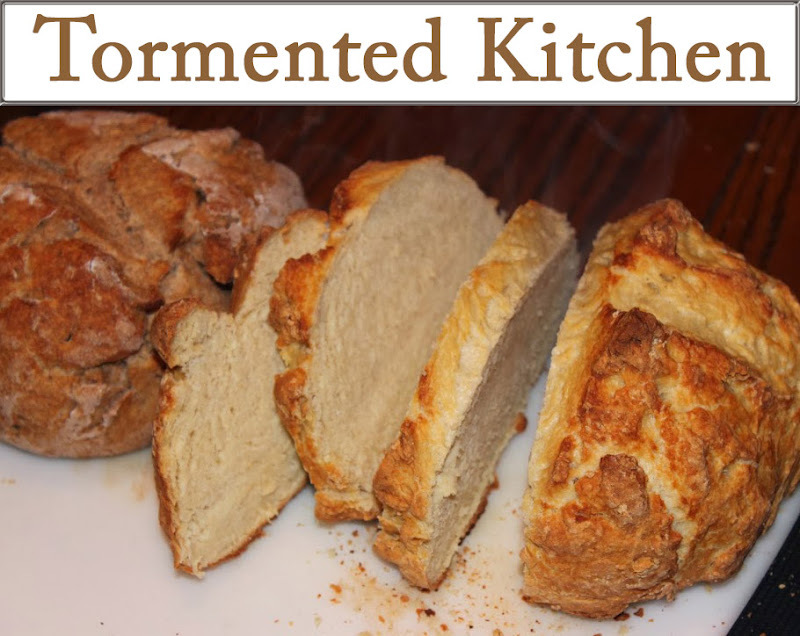 Anyhow, I gleaned this gem of a recipe from my dear hubby's stepmom. It makes a lot of food. 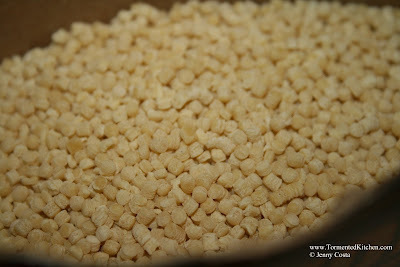 This fills a very large mixing bowl, and it's fairly addictive. It's sweet, but not too sweet. Since it's sticky and creamy, it sort of appeals to the comfort food desires. I think it would be very good if you wanted to add other tasty things like shredded coconut or chopped nuts. 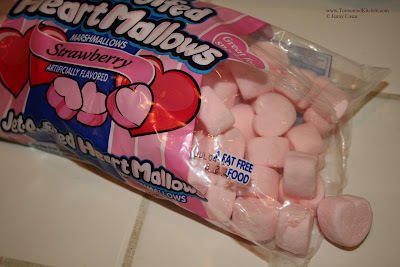 I would normally make this using the four-flavor fruit mini marshmallows, but I found these strawberry heart marshamallows for Valentines Day. I couldn't pass them up! 1 container yogurt (any fruity flavor), 6-8 oz. 1. 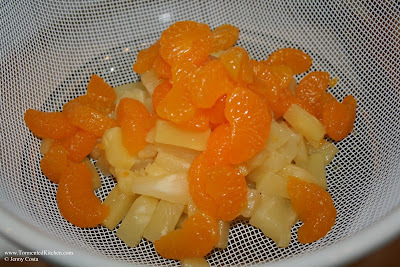 Drain the canned fruit and reserve about 1/2 cup of the juices. 2. Make the acini de pepe according to the box directions. Drain and cool. 3. 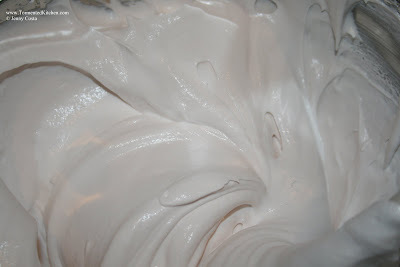 Mix together the yogurt and Cool-Whip in a large mixing bowl. 4. Add fruit, marshmallows, and acini de pepe and mix. 5. Thin with reserved fruit juices and refrigerate. It should be liquidy and floaty when you put it in the fridge, after it chills about 2 hours, all the liquid gets soaked up and the marshmallows migrate to the top.